The hobby has changed quite a bit over the past decade. There was a time when the world of sports collectibles had a healthy balance between retail sales and auctions but, today, it is clearly an auction world. As a result, hobbyists get to view tons of lot descriptions from a variety of sellers, but those lot details are not always as accurate as they should be. In the following article, PSA’s Joe Orlando discusses the issue and how it can impact the hobby. The 1975 Topps football card set is one that provides collectors plenty of reasons to pursue it. Containing a nice selection of key rookie cards such as Mel Blount, Lynn Swann and Dan Fouts, along with plenty of special cards like Record Breakers and Postseason cards, this colorful 528-card issue has plenty of appeal. In the following article, we talk to the collectors who find this 1970s set so fun to assemble. Every October, baseball champions are crowned—and sports legends are created. October is also when Goldin Auctions, the industry’s premier sports auction house, offers its one-of-a-kind "October Legends Auction," featuring some of the most significant and unique game-used memorabilia from many of the greatest players in sports. From today through Nov. 1, collectors bid on more than 1,100 items in the Goldin Auctions October Legends Auction, including sports equipment used by the biggest stars, championship rings and awards, historical sports documents, and hundreds of lots of rare cards. When you think about the 1970s, most collectors don’t view Topps sets manufactured from that decade in the same way they might view the sets from the previous two decades in terms of difficulty. That is not the case when it comes to the 1971 Topps baseball card set. Surrounded by easily-chipped black borders, this condition-sensitive issue provides one of the biggest challenges in the hobby for the high-grade collector. This large 752-card set contains several top level Hall of Famers, and those cards often bring huge dollars in the marketplace when offered in PSA Mint 9 condition. The set also contains tough cards of Bert Blyleven (rookie) and Thurman Munson, in addition to an extremely challenging high-number series. Winner of the Best Modern Baseball set for 2014, this set has a GPA of 8.86 – the highest ever recorded on the registry. Click here to view this set. 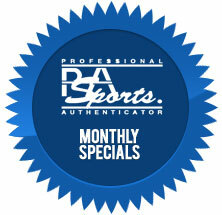 All Sports & Non-Sports Cards - $10 per Item/No Minimum – 20 Business Days (approx.) Click here for details. REA Blockbuster Fall Auction Now Open for Bidding. Auction Closes October 18. Collectors around the world have long looked to Robert Edward Auctions for the finest sports cards and memorabilia the hobby has to offer. With a reputation as the most trusted auction house in the hobby, Robert Edward Auctions has been able to bring to market countless items discovered among passed-down family possessions or originating from the most advanced collections, resulting in nearly $100 million in sales during the past decade. Beginning October 1, the company will offer more than 1300 lots in their highly-anticipated fall catalog auction, the second such event added to their calendar, which previously consisted of only a spring sale. The auction closing date is October 18. Memory Lane’s new "I Own it Now" catalog sale is now underway, highlighted by a signed and inscribed bat used by Derek Jeter to hit his only home run in All-Star Game competition. The familiar black P72 model is signed and inscribed in silver ink by the newly retired Yankees star. He used it to hit a homer for the victorious American League in July of 2001 at the new Safeco Field in Seattle. Love of the Game Auctions announces that its Fall, 2014 Premier Auction, the company’s first auction to feature a printed catalog, is now open for bidding. The auction closing date is Saturday, November 1. The sale features sports and non-sports cards and memorabilia from the late 19th Century to the present, highlighted by a rare and valuable 1933 Goudey Nap Lajoie. The card, once owned by noted collector Charles Conlon, is one of the finest examples of the Goudey rarity in the hobby. Over 200 lots ALL NO RESERVE, opening bid $.99. Featured in this batch out of a private collection are 14 PSA high grade Mickey Mantle cards from the 50s and 60s, including a very nice 1955 Bowman! From the same collection, you will also find several other high grade (PSA 8, 9, 10) pieces from the 60s and 70s in all major sports, baseball, basketball, football and hockey! The October Sterling auction includes 438 lots from the four major sports plus boxing and and non-sports. Auction feature 1909 E92 Dockman Honus Wagner PSA 4, complete 1957 Baseball set, E106 Honus Wagner, E95 Ty Cobb, 1933 World Wide Gum Lou Gehrig, 1954 Topps Hank Aaron, Rookie, High grade 1958 Mantle & Maris, E93 & E101 Cy Young, 1948 Bowman Basketball, and a nice selection of T3 Turkey Reds, Exhibits, Football and Boxing. There are 940 lots for auction that will end on Thursday October 16, 2014 at 11 PM EST using the 15 minute rule. This auction features many high grade and low pop cards for collectors to complete their sets from the 1950s through the 2000s. Offering 130 PSA Graded T206’s PSA 6-7-8 (with 90+ PSA 7’s), incl. 27 HOF’ers. Also a terrific assortment of PSA Graded Star Cards with T205 HOF’ers. All graded cards, all sports, all eras start at only $1.00! The auction runs until Friday, October 17th and features many quality PSA Cards from iconic vintage sets such as T3 Turkey Reds, T206, T205, Goudey, Play Ball, Diamond Stars, 1952 Topps, and many more! Please view our auction for your chance to bid on extremely rare Hall of Fame cards such as a 1910 E125 Honus Wagner & 1910 E103 Williams Caramel Co. Ty Cobb! Auction also features many Certified Autographed items from many sports legends. Which of the following MLB player collectibles will benefit most from their appearance in 2014 postseason play? © 1999 - 2014 Professional Sports Authenticator. All Rights Reserved.